“Ay, Papi!” is not something I’ve ever exclaimed … until this week. As the jubilation hit a notable peak, what can I say, except that Papi’s Taqueria made me do it. Whether Papi is a real boy or just a figurehead is unknown. Regardless, the Isle of Palms eatery’s namesake seems fated to become a beloved man/myth/legend, as his eponymous restaurant is only about six weeks old, yet already standing-room only on a Tuesday night. The chic, beachy spot is set in a retrofitted blue and white beach house on Ocean Boulevard, smack dab between Coconut Joe’s and the Windjammer. As you likely know, the Mississippi Delta hot tamale — the idea for which seems to have made its way from Mexico some time in the 1930s — is a cousin to the traditional version. 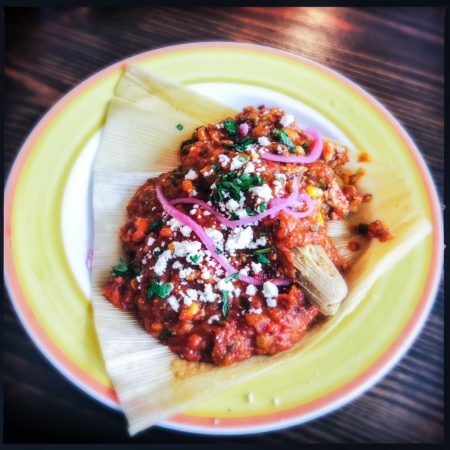 Papi’s simple, masa-made chewy tamales provide balance and texture against the spicy red sauce. Filled with small chunks of chorizo, bite-sized crawfish, and fresh corn kernels, the rich, tomato-based concoction is like a Hispanic ragu. Bold, creative, and offering a hint of crawfish flavor in every bite, this dish is a clear introduction to the talent level in the kitchen. This, quite notably, is sober fare. Filled with sweet, savory cubes of tender pork belly, fresh avocado, and a brunoise of crisp sweet potatoes, the toothy tortilla only elevates each bite. Add to that the peppery sawmill gravy and sunny side up egg, and well … jackpot. Maybe not a $1.5 billion dollar jackpot, but that kind of money is likely to ruin your life anyway. Rather, this is the sort of culinary windfall you can bank on, hangover optional. The restaurant boasts several decorating triumphs, including a retrofitted VW bus front, which serves as the kitchen window. Service is attentive, particularly thanks to the affable manager, who served as a front of house fixture, cheerfully running food and checking in on every table. One imagines he’ll become skilled at reading lips, as Papi’s becomes incredibly loud once it fills up. Bring someone you didn’t really want to talk to anyway. Meanwhile, the Tender Time Taco ($6) is apparently some sort of fan favorite, as all around me I heard it pushed by wait staff as “the best” or “most popular.” The simple taco finds a corn tortilla filled with shredded beef barbacoa, then topped with slices of avocado and radish, as well as some chopped cilantro. The beef is juicy and flavorful, and although not as inventive as some of its menu-mates, it’s a pleasing, traditional offering. The one meatless option, the Veggin’ Out ($5), sounds delectable, the menu description promising “grilled cauliflower, portobello fries, chipotle remoulade, cabbage, pepitas.” I so wanted to love this, but as served, the texture is predominantly mush, and it’s hard to distinguish much flavor beyond that of blasé grilled cauliflower. Perhaps if it were battered and fried? And maybe with some pickled element to add a little punch? The humdrum little sister of the bunch, there’s still hope, seeing as it hails from a family with great genes. 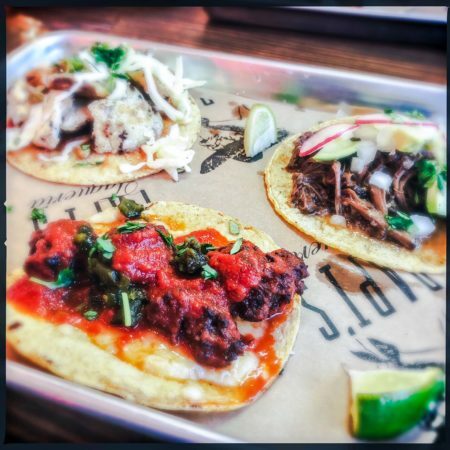 If you’re not content to enjoy your tacos in a state of measured sobriety, Papi’s offers a variety of beers, cocktails, and wines to help you out. 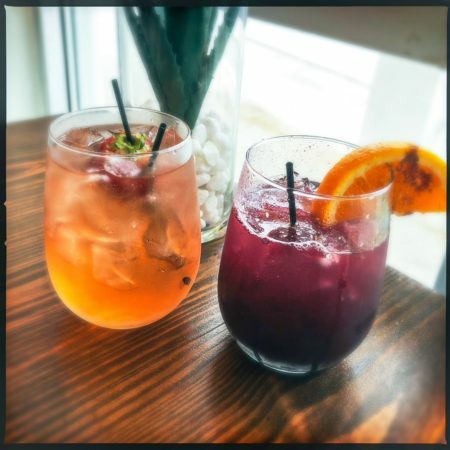 There are also two wine cocktails, among which I can attest that the Jose’s Rosé ($8) looks and tastes like, well, salmon-hued rosé, only sweeter and with notable strawberry notes. Also sampled, the La Playa Sangria ($8) goes down easy. It looks like/is wine, but tastes like grape juice with a heavy cinnamon influence. The last of the tacos sampled, the Sucio Italiano ($5) is the kind of dirty Italian you’d be proud to take home to mama. A riff on the meatball sub, why hasn’t anyone thought of this before? Made with chorizo meatballs, charred poblano, and a mild chile tomato sauce, it’s then topped with Mexico’s answer to mozzarella, queso Chihuahua. 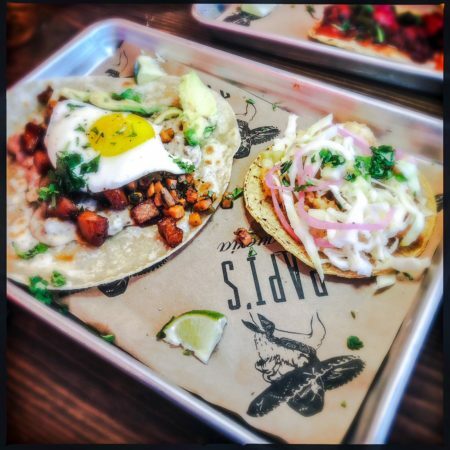 The result is a craveable taco that’s not just a great idea, but a deliciously executed one. From the chill, beachy vibe to the rooftop bar, Papi’s Taqueria seems poised for certain success. Add to that the culinary talent that managed to produce both lust-worthy breakfast and Italian tacos, and it’s easy to predict the future: They’re gonna need a bigger boat.